There are many blogs out there. Some are annonymous, some are very open and some are honest but like to keep some things away. When I started blogging I knew I wanted to be honest but only up until the past year or so I have been very honest and open about what has been in happening in my life such as falling pregnant at 16 years old, post natal depression and much more. There are still some very personal things I don't wish to share but only because I keep that to myself. You have to keep some things private don't you? When I found out I was pregnant with baby number three I knew I wanted to share my pregnancy journey on my blog. I waited until I had my first scan to announce the pregnancy as it was still a shock to us at the time. 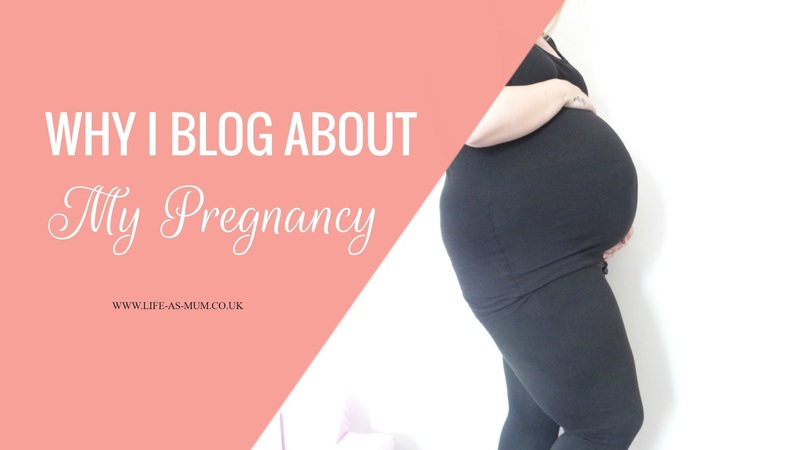 Before I announced my pregnancy I knew what kinds of posts I wanted to write, I even had a list on a piece of paper in my blogging journal and I also had a load of draft posts ready to post. I did start writing from 7+ weeks and I was going to publish but things got in the way such as the scare of loosing my baby. I wasn't sure what was going on, my head was all over the place so I decided not to write about it as my blog was the last thing on my mind at the time. I think I have written nearly everything about this pregnancy on my blog but the only thing I have not written is the week I will be induced. I haven't got the set date yet, but I will not be telling anyone other than close family and friends when my induction date is, got to keep some things as surprise! Otherwise. I have written weekly pregnancy updates which I am so proud that I have stuck to them. I write about my trimester experiences, pregnancy essentials, my personal top tips about pregnancy in the hot weather and loads of other pregnancy topics too. I really do hope I have helped or given advice to some pregnant women out there. I have also written my journey with Obstetric Cholestasis too which many people didn't know about but I hope I have started to raise a little awareness about this liver disorder in pregnancy. I have still got a lot of posts left over to write and I can not wait to start writing for the baby category for my blog. It's so exciting. I have loved writing about my pregnancy journey and it's something I enjoy looking back at too. Even writing about the girls reactions and many other things, I am glad I decided to blog about my pregnancy and capture my bump growing each week too. Even before I started blogging I read a few pregnancy blogs and I loved reading their pregnancy updates and pregnancy posts, so I guess that inspired me to blog about my pregnancy journey when I found out about baby #3 too. Here is a list of pregnancy bloggers and mixed with a few of my favourite pregnancy bloggers too! I think it's really cool that you did this. I wish I had documented more of my pregnancies. It's like an on-line journal writing about your pregnancy and I'm sure it will be good to look back on and remember what you went through as each pregnancy is different. I love reading about the journeys us women go through in our lives, and a pregnancy is one of the biggest and most important journeys we can go through! It's very inspiring! I think its a nice way to document everything, which you can look back on in the future and remember the good and not so good times! One of the best gifts you can give to yourself and to your child is documenting these awesome nine months. I think it's nice to document things and also share information with others that might be going through the same things related to pregnancy.